When a marriage ends, it can feel like the world has been turned upside down, and you’re suddenly faced with an uncertain future. Seeking legal assistance can be the first step toward creating a new life for yourself. 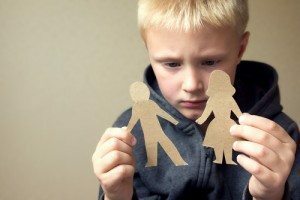 At the law firm of Rita T. Jerejian, LLC we help resolve complicated family disputes throughout Hackensack, NJ and the surrounding areas. and compassionate support and reassurance. Ms. Jerejian negotiates firmly and in good faith to resolve these issues in a timely and cost-effective manner, and she also possesses the litigation skills to forcefully advocate for you in court if needed. 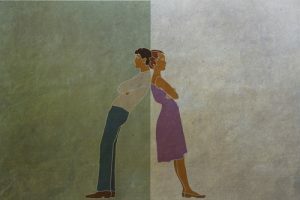 There are two approaches to divorce in New Jersey: contested and uncontested. If you have a spouse who is very combative and refuses to compromise on any issue, you will most likely have no choice but to take them to court. In a contested divorce, lawyers will present adversarial positions to the judge, and the judge will make legally binding decisions on the contested issues. In an uncontested divorce, there is a much better chance of reaching mutual agreement on all the issues with little court involvement. Mediation: A qualified, neutral person facilitates negotiations between you and your spouse to help you achieve a compromise and reach a settlement. Binding arbitration: The parties present their case to an independent decision maker who makes legally binding decisions about disputed issues. If you use these methods, all the court has to do is approve and finalize the agreement. Rita Jerejian is an experienced family law attorney. If you are in Hackensack and need help related to spousal support or alimony she can help you. She helps with all matters related to spousal support including modifications. 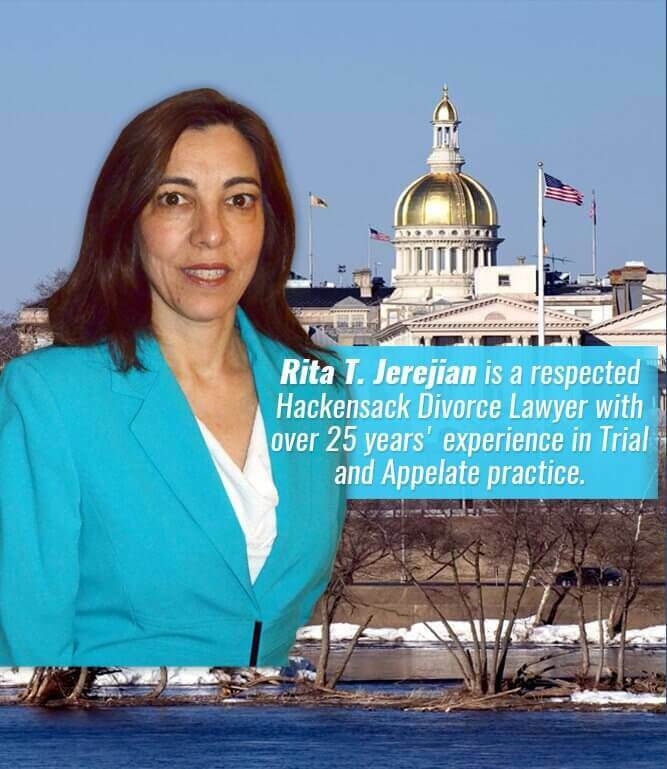 Her divorce & family law practice is conveniently located in Hackensack, NJ. 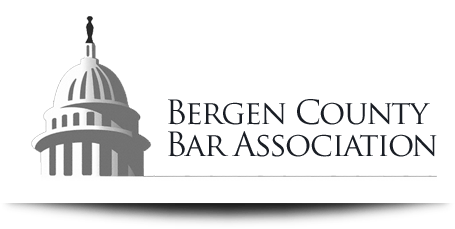 She helps clients with alimony & spousal support matters throughout Bergen County. 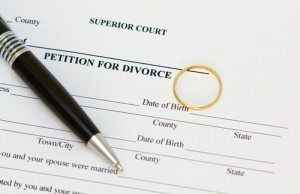 Divorce requires the careful preparation and submission of many legal documents that can be complex and confusing. Ms. Jerejian can handle the complex paperwork for you and make sure to guide you every step of the way. 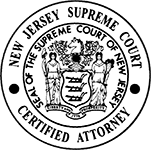 To file for divorce in New Jersey, you or your spouse must have lived in the state one year before filing. If you meet this requirement, you can proceed to filing a Complaint for divorce with the Family Court clerk in the county where you live. The only cause of action where the one year residency requirement is not necessary is adultery. Extreme cruelty, either bodily or mental. Your spouse will be served with the petition and will have 35 days to file a response. How Will Our Marital Property Be Distributed? assets and debts you and your spouse acquired during your marriage. This excludes anything you may have acquired before the marriage, as well as any personal gifts you were given, such as an inheritance. Dividing marital property can be one of the most contested parts of a divorce, but it doesn’t have to be. You and your spouse will have the chance to negotiate property divisions, either independently or with a mediator or arbitrator’s help. If you are unable to reach a compromise, a judge will make the decision. New Jersey is an equitable distribution state, which means the judge will divide property according to what is considered “fair under the circumstances,” not necessarily a 50/50 split. There are certain factors the court takes into account when dividing assets such as the length of the marriage, income levels, and value of property. 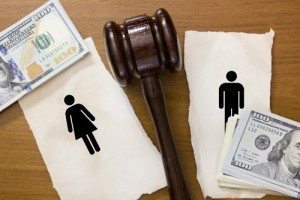 Am I Eligible For Alimony/Will I Have To Pay Alimony? Alimony Pendente Lite: This type of alimony is awarded to provide assistance during the divorce process itself, from the time of the filing to the final decree. There’s no guarantee this support will continue after the divorce. Rehabilitative Alimony: This is the most common type of alimony and is usually awarded for a finite period of time until the receiving spouse can become financially independent. In many cases, the receiving spouse will go back to school or get additional training in a particular field with the end goal of obtaining a job. Rehabilitative alimony is typically paid for one to five years. Indefinite Alimony: This alimony is awarded for an indefinite period of time due to the receiving spouse’s age, illness or disability, or inability to make reasonable progress toward being self-supporting. You and your spouse will be given every opportunity to resolve issues related to your children outside of the courtroom. This is an amicable alternative to a hotly contested custody battle and is much better for the children involved. If you simply cannot establish an agreement, a judge will decide what is in the best interests of the children. regarding the children’s everyday life, which may include such things as education, healthcare, and religion. Joint legal custody will allow both parents to have input on these issues. Physical custody refers to who the child will reside with or spend the most time with. Sole custody refers to one parent having either sole legal or sole physical custody or both. Here, the sole custodian has the decision-making power and also has physical custody of the child. The non-custodial parent would have appropriate parenting time, depending on the case. The custody determination is based entirely on the best interests of the children. How much child support will I receive from—or pay to—my spouse? Your divorce decree is meant to be final, but it’s not uncommon for issues to arise post-divorce. A sudden change in income, new needs of the children or the necessity for one party to move out of state can require modification of the final divorce judgment any time after a divorce. Whether you need to request a divorce modification or you require assistance enforcing the terms of your divorce, Rita T. Jerejian, LLC can help. 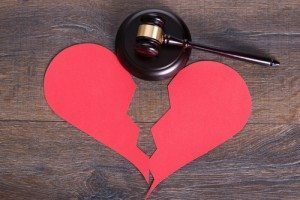 At Rita T. Jerejian, LLC, we offer compassionate yet aggressive divorce representation for clients throughout Bergen County, including Hackensack, Paramus, and Ridgewood. To schedule an appointment in our New Jersey office, call 201.489.7714 or contact us online.